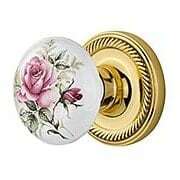 Porcelain door knob sets will bring the same timeless charm to your home as they did in the 19th century. 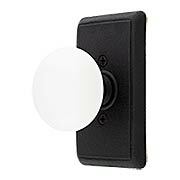 Choose from white, black or brown porcelain knobs with handsome matching backplates and rosettes available in a variety of finishes. 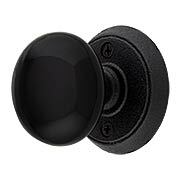 Like the proverbial "little black dress", these jet black porcelain knobs are right for every occasion. Wildly popular throughout the Victorian era, they are an equally compelling choice today. Updated to accommodate pre-drilled doors and offered in six classic finishes, this tailored porcelain door set adds instant style to any new construction or renovation. 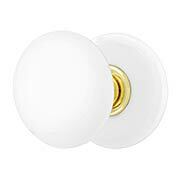 Crisp white porcelain knobs are the perfect complement to this tailored and understated "New York" door set. 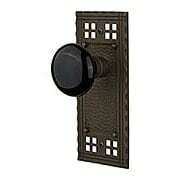 Whether your style is Victorian, Craftsman, or Colonial-Revival, this classic design will fit right in. 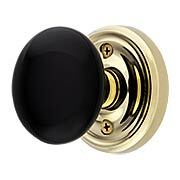 Available in your choice of six popular finishes, it features substantial, forged-brass parts and a heavy-duty latch for enduring quality, backed by our five-year warranty. 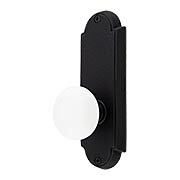 Austere porcelain knobs are the perfect complement to this tailored and understated "New York" door set. 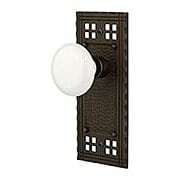 Whether your style is Victorian, Craftsman, or Colonial-Revival, this classic design will fit right in. 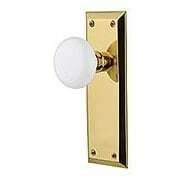 Substantial forged-brass parts and a heavy-duty latch provide enduring quality, backed by our five year warranty. 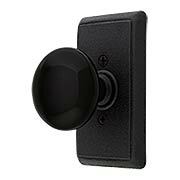 Comely and understated, this traditional set features the all-around sophistication of a black porcelain knob and rope-styled rosette. Expressed in six finishes. 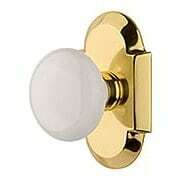 Give your home a wonderful old-fashioned touch with the pure and simple charm of white porcelain door knobs. To complete the vintage look, the traditional round rosettes come in our exclusive Antique-By-Hand, a living finish that ages gracefully over time into a beautiful natural patina. Finely crafted from solid, forged brass for a lifetime of beauty and trouble-free performance. 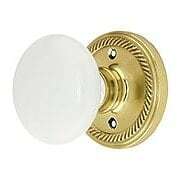 Pure white porcelain knobs add a sweet Victorian touch to this lovely Meadows door set. The classical revival design, with its beaded borders and graceful foliage, recalls P & F . Corbin's circa 1905 "Como" Pattern. 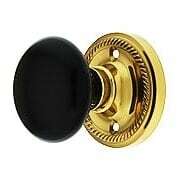 Our modern recreation is top quality forged brass, designed for lasting quality and performance. 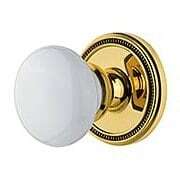 Simple and homey, with cheerful porcelain knobs and sturdy back plates, the Prairie door set is a great choice for any Craftsman, Cottage, or Colonial style home. Ideal for new construction, the entire set is finely crafted from solid forged brass to provide years of enduring quality and enjoyment. These generously sized arched rosettes are a fresh alternative to a standard round rosette or long escutcheon. Perfectly paired with our crisp white porcelain knobs, and offered in six popular finishes, they'll work with any style of traditional decor. 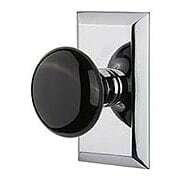 Made of top-quality forged brass with heavy-duty mechanics, to provide you lasting beauty and smooth performance. 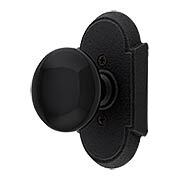 Austere porcelain knobs are the perfect complement to the rugged, hand-hammered details of our Pasadena door set. Classic Arts & Crafts in design, this vintage reproduction is the perfect enhancement to any Craftsman-style home or bungalow. 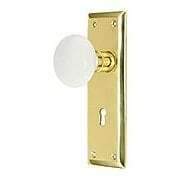 Substantial forged-brass parts and a heavy-duty latch provide enduring quality, backed by our five-year warranty. 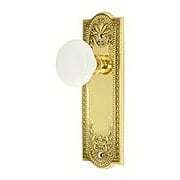 The Grandeur Soleil Rosette Door Set with Hyde Park Porcelain Knobs is a delightful mix of traditional styles. 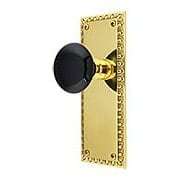 Constructed of solid forged brass, this elegant design is exhibited in refined detail, while smooth, yet sturdy mechanics offer silk-like operation. 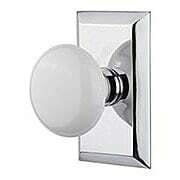 Easy and quick installation makes restoration or new construction efficient and exact. 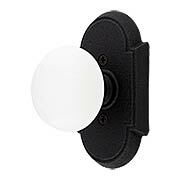 Crisp white porcelain knobs are the perfect complement to the rugged, hand-hammered details of our Pasadena door set. Classic Arts & Crafts in design, this vintage reproduction is the perfect enhancement to any Craftsman-style home or bungalow. 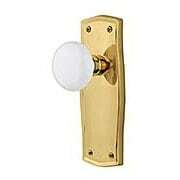 Substantial forged-brass parts and a heavy-duty latch provide enduring quality, backed by our five-year warranty. Painstakingly recreated from an antique original, our Ovolo Door Set with White Porcelain Knobs adds instant elegance to your doors. 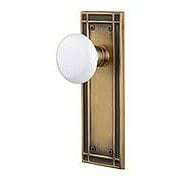 Inspired by a circa 1900, neo-classical design, each back plate features a vintage egg and dart border, while sleek porcelain knobs offer a dash of sophistication. 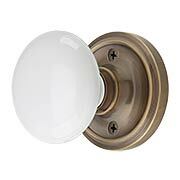 This exceptional set is forged in solid brass, lending to its crisp pattern detail. Enduring quality, simple installation, and our five-year warranty make this an excellent choice for restoration and new construction. 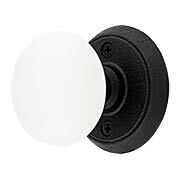 Crisp white porcelain knobs are the perfect complement to the simple, clean design of our Mission door set. Harkening back to the Spanish-Colonial period of the Western frontier, the square corner design features inlaid steps nestled within its geometric shape. 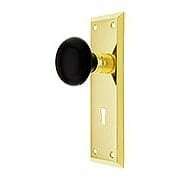 Substantial forged-brass parts and a heavy-duty latch provide enduring quality, backed by our five year warranty. 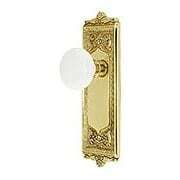 Soft white porcelain knobs add a sweet Victorian touch to this imposing brass door set. 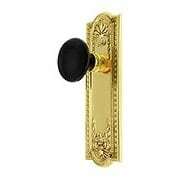 The large plates, lavished with traditional neo-classical designs, give your doors instant elegance. 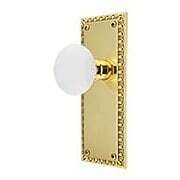 Enduring quality and simple installation make this an excellent choice for any new or vintage home.